Beckman Postdoctoral Fellows Gillian Hamilton and Tomasz Wrobel will present the Feb. 23 Director’s Seminar at noon in Room 1005 of the Beckman Institute. Hamilton will discuss “Alcohol and the Developing Brain,” and Wrobel will talk about “Speeding up Cancer Imaging with Quantum Cascade Lasers.” The lecture is open to the public and lunch is provided. Developmental alcohol exposure in humans can result in a wide range of deficits collectively referred to as Fetal Alcohol Spectrum Disorders (FASD). FASD-related impairments in cognition and learning persist into adulthood and are accompanied by structural changes in multiple brain regions including, but not limited to, the prefrontal cortex (PFC). Alteration in the inhibitory circuit of the PFC, most notably Parvalbumin+ (PV+) GABAergic interneurons may produce FASD-induced PFC behavioral deficits. PV+ cells both powerfully regulate the excitatory output of PFC pyramidal cells and also affect the patterns of neuronal activity. Therefore, the loss of even a small number of PV+ cells could potentially change and impair pyramidal neuron output and regional cortical function. Here we measured the number of PV+ cells in adult PFC following a third-trimester equivalent alcohol exposure. We also assessed behavioral performance on the Passive Avoidance task. Further, we explored the therapeutic role of aerobic exercise. Exercise consistently has been shown to improve hippocampal function and plasticity in the alcohol-exposed brain, while its influence on the mPFC is much less established. A third-trimester equivalent alcohol exposure significantly reduced the number of PV+ cells and impaired acquisition of the Passive Avoidance task, regardless of exercise intervention. Overall, these data demonstrate the long-term, detrimental, influence of a third-trimester equivalent alcohol exposure on PFC anatomy and function and they indicate that voluntary exercise may not be a sufficient therapeutic intervention to combat FASD-induced deficits. Gillian Hamilton earned her B.S. degree in psychology from Arizona State University in 2004. In the fall of 2012, she received her Ph.D. in psychology, with a concentration on behavioral neuroscience, from the University of Delaware under the supervision of Dr. Anna Klintsova. In July 2016, she was awarded a National Institutes of Health Ruth L. Kirschstein Postdoctoral Individual National Research Service Award. 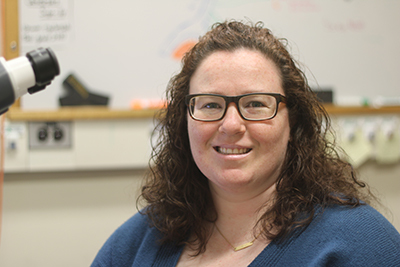 Hamilton’s research focuses on the long-lasting effects of fetal alcohol exposure on the brain. She is interested in cellular plasticity in the healthy brain versus the alcohol-exposed brain and the subsequent impact on behavior. Her hope is to further elucidate exactly how developmental alcohol exposure impacts the developing brain, resulting in life-long damage in order to develop more targeted interventions. Hamilton currently works as a Beckman Institute Postdoctoral Fellow under the mentorship of Justin S. Rhodes, a professor of psychology and a member of Beckman’s Cellular and Molecular Foundations of Intelligent Behavior Group. Histopathology, conducted by manual examination of microscopic structural morphology within stained tissue sections, is the gold standard for cancer diagnosis and therapy. Chemical imaging is a rapidly emerging field in which molecular information within samples can be used to predict biological function and recognize disease without the use of stains or manual identification. Infrared (IR) spectroscopic imaging is an emerging technique, especially in a high-definition (HD) format, that provides the spatial specificity of microscopy at magnifications used in pathology. IR absorption by tissue creates a strong signal where the spectrum at each pixel is a quantitative “fingerprint” of the molecular composition of the sample. This information is a basis for advanced machine learning methods that can predict the histopathological status of the tissue. The traditional approach to spectroscopic analysis has been to record the entire spectrum at regular spatial intervals while illuminating the sample with a range of frequencies. The emergence of Quantum Cascade Lasers as light sources in IR may represent a fundamental shift in how we approach spectroscopic imaging: Rather than collecting full spectra that contain redundant information, measuring a few important spectral frequencies may enable significant gains in speed, throughput, signal to noise ratio, and/or image quality. Here, these gains are investigated using a prostate cancer histopathology model that can be potentially translated to the clinic as a screening tool. Throughout his research career, Tomasz P. Wrobel has been always involved in interdisciplinary studies in which different biological questions were tackled with novel techniques of chemical imaging. First, he focused on atherosclerosis and endothelium dysfunction during his Ph.D. studies at the Faculty of Chemistry, Jagiellonian University, Poland, and during his research assistant employment in Jagiellonian Centre for Experimental Therapeutics (JCET). Then he transitioned to a cancer-oriented environment at the Beckman Institute, which also includes collaboration between multiple research groups. In the near future, he wants to extend the scope of cancer studies to other cancer types. His ultimate goal is to create a personalized medicine approach using chemical imaging, which will be critical in clinical workflow. 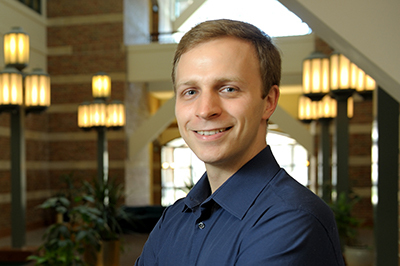 Wrobel currently works as a Beckman Institute Postdoctoral Fellow under the mentorship of Rohit Bhargava, a professor of bioengineering and a member of Beckman’s Bioimaging Science and Technology Group.